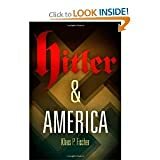 The author of several works on Nazi Germany and Nazism, in this volume Prof. Fischer (Allan Hancock College) gives us a look at Hitler’s complex views about the United States, how these came about, and how they affected World War II. Almost simultaneously, Hitler admired the U.S. as a great achievement of the “Nordic race,” envying it for its vast industrial resources and great technical expertise, while despising it for its crass materialism, "racial degeneration," and supposed dominance by Jews. His perceptions of America were derived from contacts with friends who had lived or travelled there, from reading, including the western novels of Karl May and the racist tracts of Madison Grant, and from American motion pictures and animated cartoons. While focused on Hitler, Fischer also takes a shorter, but no less useful look at FDR’s views of Germany and the Nazi leader, which were generally more realistic, but also affected by some misunderstandings and preconceptions, despite the fact that the president could read German. Hitler and America is an important work for anyone interested in the Second World War.